The 3rd Annual Nitro Nationals at Motiva Motor Speedway’s The Dirt 300 in Albuqerque, NM produced an exciting evening of sand drag racing. Courtney Stidham made it four wins in a row with his “Twisted” Top Eliminator Dragster taking a hole shot win over Terry Crawford 3.12 to 3.10. The featured classes on the weekend were the Pro Open bracket classes. The Pro Open Cars class was an all New Mexico battle with Anthony Brown turning on the win light in his Altered over Shawn Maloy’s Jeep. 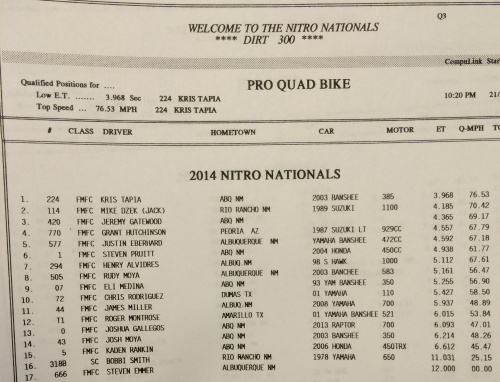 The Pro Open Quad final round saw local racer James Miller take the big win over Arizona’s Grant Hutchinson. Other winners on the night included Mike Pruitt (Open Heads-Up Quad), KC Springer (4x4), John Eberhard (Quad/Bike), Damon Hall (Pro Gambler), Justin Eberhard (Pro Quad Gambler), Travis Brown (Juniors & Junior Gambler), and Antonio Marquez (Youth). Run Sheets & Final Round Videos are now posted. 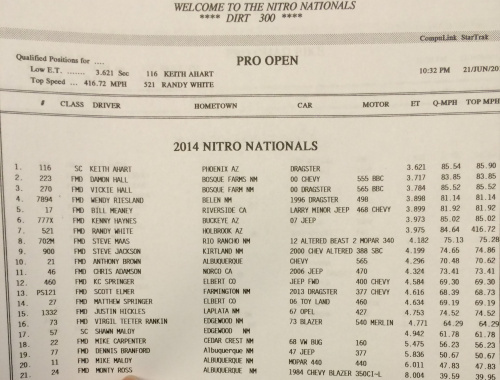 Day two of racing at the Third Annual Nitro Nationals in Albuquerque, NM is complete. Qualifying wrapped up on Friday to set the ladders for Saturday’s Eliminations. Texas racer Courtney Stidham leads the pack in Top Eliminator with a 3.063. Courtney will face off with Terry Crawford on Saturday to determine the TE class champion. Keith Ahart was the Top Qualifier in the Pro Open Cars class while Kris Tapia ran Low ET in the Pro Open Quads category. Other top qualifiers included Mike Pruitt (Heads-Up ATV), Bill Meaney (Truck), Mike Eberhard (Quad), Kaden Rankin (Juniors), and Antonio Marquez (Youth). Today’s racing also saw the first Gambler classes of the weekend. California’s Bill Meaney turned on the win light in the Pro Gambler Car final over Steve Maas. Arizona’s Grant Hutchinson took the Pro Gambler Quad win over Bobbi Smith. Christopher Segura scored the win in the Juniors Gambler over Tiffani Duran. Eliminations kick off Saturday evening at Motiva Motor Speedway’s The Dirt 300. Field is split into half by ET for Eliminations. Winner of both ‘A’ & ‘B’ race off for 1st/2nd place. National Sand Drag News will be on-site at Motiva Motor Speedway's The Dirt 300 in Albuquerque, NM for the 3rd Annual Nitro Nationals on June 19-21. This race features a Top Eliminator 2.95 Index category as well as Pro Open Cars & Quads classes with healthy payouts across the board. NSDN will have our normal race coverage including all the stats, results, news, and videos each night after racing action is complete. Be sure to check our Twitter Feed at the top of the each page or visit the Twitter Feed directly at www.Twitter.com/NSDN. Also, we will be updating the NSDN Facebook page throughout the event at www.Facebook.com/NationalSandDragNews. This NSDN Daily Race Coverage event is brought to you courtesy of The Dirt 300 and Motiva Motor Speedway. Racing kicks off on Thursday with Test and Tune as well as First Round Qualifying for Top Eliminator and the rest of the bracket classes. Check back throughout the weekend for all the latest news from this event.